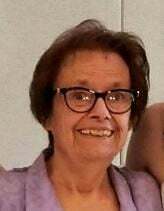 Whitehall has lost a winning smile and an amazing personality with the passing of Betty (Fellows) Piazzola on January 31, 2019. Betty was greeted in heaven by her loved ones — husband, Harold and son, Kent. Betty was born on June 25, 1934 to Tom and Margaret (Capp) Fellows. Betty had many fond memories of living in Elk Park and attending school there until 3rd grade, when her family moved to Whitehall. She graduated from Whitehall High school in 1953. After graduation Betty trained to be a stewardess. Unfortunately she only worked for the airlines in California for a short time before they went on strike so she returned to Whitehall where she worked in a malt shop and bakery. On June 30, 1956, she married the love of her life, Harold Piazzola. Together, Betty and Harold had six children. Betty loved to sew, often making matching outfits for her children. Later in life she started making beautiful quilts, pillow shams, stuffed animals and dolls. Betty and Harold traveled to craft shows across the state of Montana selling their wares. Betty is survived by five of her children – daughters, Kelley (Joe), Lynn (Bill), Tracey and Tona Gene (Greg) and son, Larry (Dot); grandkids, Patrick, Margaret (Tyler), Kent (Lindsey), Clara (Kara), Zachary (Jayde), Tyler, Colter and Dakota; brothers, Tommy Toy (Kathy) and Don; sister, Marlene (Phil); along with several sister- and brothers-in-law, aunts, uncles and cousins. Betty was preceded in death by her husband, Harold; son, Kent; parents; and numerous aunts, uncles and cousins. Betty’s favorite color was red and she would like to welcome everyone to wear red to her services. Visitation will be held Friday, February 8, 2019 at 6 p.m., at K&L Mortuary in Whitehall. Funeral Mass will be celebrated Saturday, February 9, 2019, at 10:30 a.m., at St. Teresa’s Catholic Church in Whitehall. Donations may be made to The Jefferson Valley EMS and Rescue (PULSE) P.O. Box 511, Whitehall MT 59759.